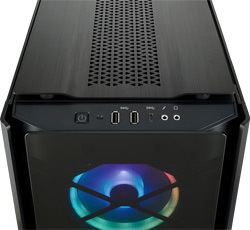 The Corsair Obsidian Series 500D RGB SE is a high-end mid-tower enthusiast PC case. With an aluminium construction and smoked tempered glass side panels, this stunning chassis can display your system in style. 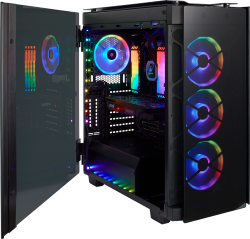 This version of the case also includes three Corsair LL120 120mm front fans with stunning RGB lighting effects, all controlled by the Corsair Commander Pro Lighting System and Corsair iCUE software. The construction of the Corsair Obsidian 500D RGB SE case is a joy to behold. The iconic Obsidian series styling, with clean lines and stunning smoked tempered glass front and sides, shows off the very best of your system build. The tempered glass side panels are actually hinged doors, making accessing your system a breeze, whilst the solid aluminium top plates and door handles add strength, refinement and have a premium look. Building your system is easier than ever! Installing fans or radiators is easy, with removable trays allowing you to install everything in open space and then slot right in - no more struggling to reach a screw or port. Plus the front and top panels have built-in, removable dust filters to keep the inside clean. There's plenty of storage space too, with easy-to-use mounts for up to two 3.5" and three 2.5" drives. The Corsair Obsidian 500D RGB SE also sports a front panel USB 3.1 Type-C connection, giving you up to 10Gbps connection speeds when paired with a compatible motherboard. There's plenty of room for powerful components. The Corsair Obsidian 500D RGB SE supports graphics cards up to 370mm in length, giving you room to fit even the most powerful GPUs available today. You can also fit a large air tower cooler up to 170mm high, for the very best in cooling performance and silent running. Radiators up to 360mm are also supported for extreme liquid cooling. Finally, the Corsair Obsidian 500D RGB SE also includes excellent RGB lighting options. There are three Corsair LL120 RGB fans pre-installed in the front, pushing air through your system and out the top/rear of the case. These are connected to the included Corsair Commander Pro hardware control system, which can support up to six fans for further expansion, and are controlled by the Corsair iCUE software, where you can set fan speeds and RGB effects with ease. Loaded with the very best that CORSAIR has to offer, the Corsair 500D RGB SE makes it easier than ever to build your dream PC. Sharp, Black, and Beautiful: Iconic Obsidian series styling with a beautiful smoked tempered glass front and clean exterior lines. Built Better: Solid aluminium top plate and door handles add a refined feel and premium look. Brilliant RGB Lighting: Three LL120 RGB fans create a symphony of stunning RGB colour. Built-in Smart Lighting and Fan Control: An integrated CORSAIR Commander PRO fan and lighting controller grants superior control over almost every aspect of your system via CORSAIR LINK software. Keeping your Components Cool: Direct Airflow Path™ design channels cool air where your PC needs it most. Future-Proof Front Panel: Featuring a super-speed USB 3.1 Type-C port and additional connections for all modern peripherals. Removable, Built-in Dust Filters: Keeps your build looking clean. Internal Expansion Bays 3 x 2.5"
The Obsidian Series 500D RGB SE is a premium mid-tower enthusiast PC case with iconic CORSAIR design, smoked tempered glass panels and premium aluminium trim. CORSAIR COMMANDER PRO - Connect. Command. Control.